It's no secret that I abhor waste and try to find uses for all sorts of scraps - so here's another! This card features the strip leftover after I'd been cutting out Swirly Snowflakes! With Stampin' Up! On Stage just around the corner, I've been really busy making swaps for the event. I'll be one of 50 of the Crazy Crafters Team at the Sydney event - so I'm making (almost finished!) 65 swaps. I'll share them with you on Monday 9 April! 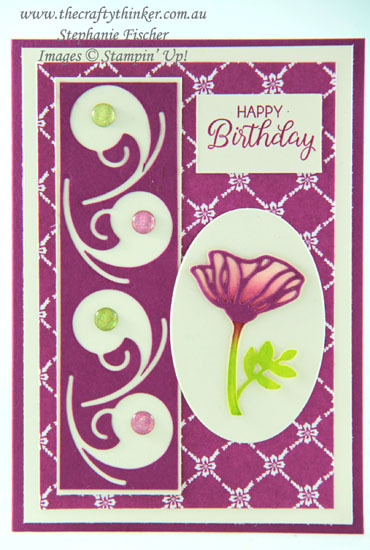 One of the elements in those cards is a Berry Burst scroll cut with one of the Swirly Snowflakes dies. Well, there are two on each card - so that's 130 scrolls! I cut them from strips of cardstock to save as much waste as possible and squeezed them together as close as I could. Then I looked at the leftover strip and decided to put it to use - part of one of them, anyway. I'm not sure what I'll do with all the rest! The base card is Berry Burst with layers of Very Vanilla and Fresh Florals Designer Series Paper in Berry Burst. I cut the flower from the Eclectic Layers die set out of Very Vanilla cardstock and used sponge daubers to colour it. I then added the top layer that I cut from Berry Burst card. I used a similar process for the leaves using the Lovely Laurel die set. 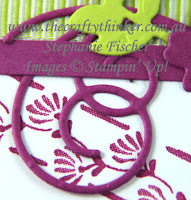 I adhered the flower to a scrap of Very Vanilla card cut with one of the Layering Ovals framelits. The sentiment is from the Beautiful Bouquet set, stamped onto a little scrap of Very Vanilla card. To finish the card, I placed a Glitter Enamel Dot in the centre of each of the cut outs.